Not just Okinawa, Yamanashi as well now that there's two SMD districts instead of three. And the three Bozos who visited Glendale, CA to complain about the Comfort Women memorial last year all lost their seats. So much for defending the nation's pride. Or maybe it was voter annoyance that these first-termers took an overseas trip. I entirely agree with this post. 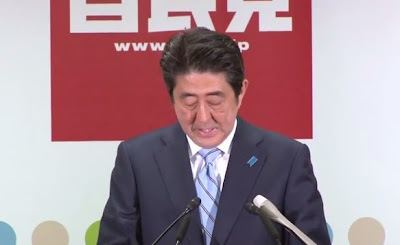 As a strategic matter, the election was a flop -- exactly the same proportion of seats for LDP as before (61.26% now vs. 61.25% last time around), with right-wing pals gone and a reenergised opposition. (And even taking the 5-seat reduction into account, LDP won fewer district seats than last time, too.) Plus people are annoyed at the expense of a national election that leaves everything more or less the same. I heard Kaieda make a pitch in my Tokyo District 1 neighborhood: there were a few fans in the small crowd that gathered, but the opposition is well rid of such a sad sack. Nonetheless, an email I got from one intelligent US-based Japan scholar of my acquaintance referred to the election as a "blowout" (in a good way) for LDP, and doubted that Abe "foresaw the extent of the victory going in." I suppose we'll be reading a lot of that sort of thing in the next few weeks.